After some established Riders to Watch for 2017, here is a selection of ten neo-pros to introduce ahead of the new season with a mix of stage race stars and classics champions and a couple of riders who have excelled in both and need to decide what they type of rider they’ll become. David Gaudu (pictured, Photo by Flickr’s Ronan Caroff/) is from Brittany in France but seems more at home in the high mountains. He won the Tour de l’Avenir last year which means he tops the page here. This U23 race stage race tops the calendar of amateur stage races and the list of recent winners includes many of the most promising stage racers in the pro peloton too. Gaudu wasn’t just the best in the Avenir, looking back he had a great season as he won the Peace Race too, all while aged just 19. He finished 5th overall in the tough and mountainous Tour de l’Ain alongside the pros too after making the main break in the mountains. He was second in the Ronde de l’Isard’s summit finish too. As well as the prolific results the manner impressed, no luck or race craft, just an impressive climbing speed. But he’s now just 20 and you wonder if he’s stepping up too soon, the leap the World Tour is big for someone who has burst on to the scene. One rider who can pass on tips is new team mate Thibaut Pinot because he turned pro age 19. Second to Gaudu in the Tour de l’Avenir was Edward Ravasi and by contrast there was talk of him turning pro but he stayed on a year with Lamre-Merida’s feeder team Colpack and now he’s turning pro with the team, now under new sponsorship of the UAE Abu Dhabi. It’s one of the sport’s strange things that we have a team bearing the name of a nation but it has next to nothing to do with that country and the UAE Abu Dhabi team is still Lampre, the northern Italian pro team. Ravasi’s a local from the Varese area and a tall and lean climber with plenty of top results to his name including the final stage of the Giro Ciclistico della Valle d’Aosta Mont Blanc, a race as gruelling to finish as it is to type out in full upon each reference to it and this stage win happened below the Matterhorn on the same climb that Ryder Hesjedal used to power away and ultimately win the Giro d’Italia. A future Giro winner too? Time and more will tell but his tall build means he could carve out a valuable role as a mountain gregario too. Filippo Ganna has been a team mate of Ravasi and now moves with him to the same UAE pro team. You might know Ganna already thanks to his win on the track last year where he became World Champion in the 4km pursuit and two months late won the U23 Paris-Roubaix. He achieved both feats while still a teenager and in style too: setting a new Italian record for the pursuit; and arriving solo in the Roubaix velodrome. He’s set for the classics and reminiscent of Roubaix winner Andrea Tafi with his big build, tree-trunk thighs andthe old school bike position featuring a low seat-to-bar drop which means he rides with his elbows bent when in full flow like his predecessors. That vintage vibe is reinforced by his visit to a local church soon after winning the track worlds to pose with the rainbow jersey and his priest, a rare sight today. 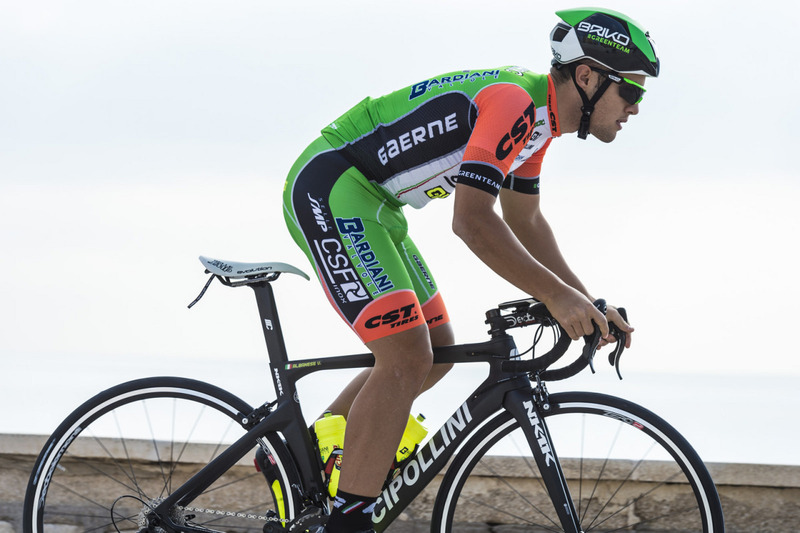 Vincenzo Albanese has signed for Bardiani-CSF. Why sign for a Pro Conti team when you’re such a big talent? Because you’re Italian and there are no Italian teams in the World Tour. Besides he’s been riding for an Italian U23 team that worked as Tinkoff’s feeder squad and the demise of the Russian squad closed off this avenue too. There’s something of the Sagan in Albanese, visually at least with his chunky legs rather than his skills. He sprints well and won a stage in the Tour de l’Avenir plus the points jersey and even beat the pros last year to win the Trofeo Matteoti but he’s more than a sprinter, at least among the U23 ranks he’s been excellent in hillier races too. He’s notable too because he’s from Campania, the region outside Naples making him one of the rare pros from Southern Italy. From south to north now with Denmark’s Mads Würtz Schmidt who looks set to star in the spring classics. Katusha have quietly brought on (and bought) several young classics riders like Nils Politt and Sven Bystrøm and the Dane could eclipse them both. 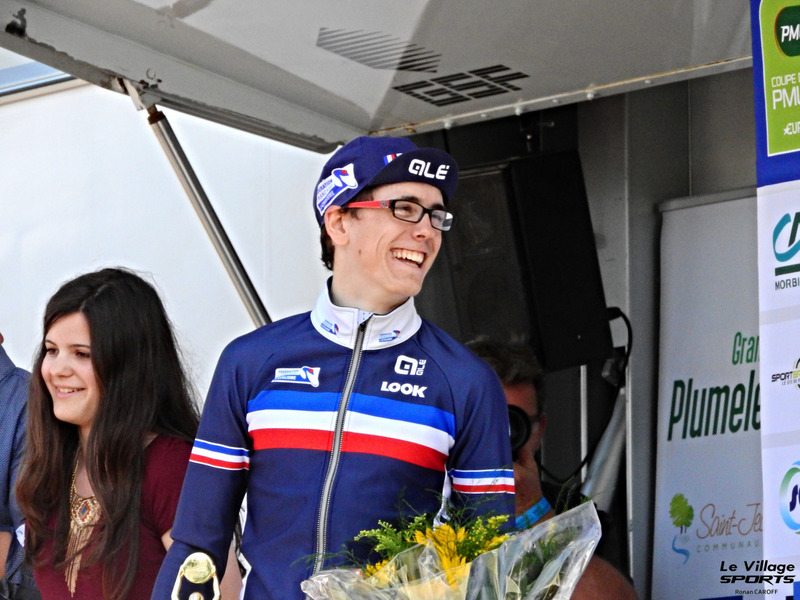 He was U23 world time trial champion in 2014 and has a stage of the Tour de l’Avenir to his name too. He’s from a cycling family, a profile over at cyclingnews.com explains his father was one of Denmark’s best MTB riders and also says he fancies his chances in hillier races and he won the hard Triptyque des Monts et Châteaux in the Belgian Ardennes. It’ll be great if he’s so polyvalent as a pro but the top flight of the sport sees every niche filled by specialists so he might have to choose. To illustrate this Tom Boonen was runner up in Liège-Bastogne-Liège’s U23 version yet a result, even a start, in the pro version of this race sounds fanciful. Nans Peters may have to choose what do as well. He can climb and has been spring classics contender too. In 2015 he finished in the top-10 overall in the Tour de l’Ain and earlier that year finished fourth in the U23 Tour of Flanders too, a late puncture ruining his chances of a win within his grasp. He’s the latest rider off the Chambéry conveyor belt of talent (Bardet, Latour) that feeds Ag2r La Mondiale. Despite the Dutch-sounding name he’s French and told Direct Vélo he was named after a shepherd character from a TV series he can at first glance look more like a footballer or even a rugby player with his solid build. The camera often lies in cycling photos and he’s not that big but he does look larger than you might expect for someone so at ease in the mountains, it’s that barrel chest which surely means cavernous lungs. His recent results haven’t been as prolific as could be expected but he’s had injuries. He seems to be a data geek, his personal website doesn’t just list every result and diary entries but is packed with data like the total vertical metres logged in the year and he’s keen on Strava too. Tao Geoghegan Hart will be familiar to many. British readers will know him because he’s British and has signed for Team Sky, US readers will know him from his time on the American circuit with Axel Merckx’s Axeon Hagen Bergmans team and French readers might know him from his role in the “Rêves d’Enfer” film about the U23 Paris-Roubaix. Of all the riders here the move to the pro ranks seems inevitable for Geoghegan Hart who has been linked to Team Sky for a long time. Even as an amateur rider he’s had pro media skills, a recent interview with The Cycling Podcast has him pouring out articulate views on his team and the U23 scene while many neo-pros – and veteran riders – are microphone-shy and tend to stick to safe phrases like “I’m taking it day by day“. He’s got the results and consistency at the highest level, the interesting thing will be seeing whether he can progress at Team Sky, both because he seems a polished product already but also because Sky isn’t seen as a place to develop, especially for climbers who can’t pace their career with spells on the British track team. Enric Mas gets better every year. He’s from the Spanish island of Majorca and turns pro with Quick Step. He’s been labelled the “next Contador” and he is a promising stage racer from Spain but the connection is made by some because he’s also been on Contador’s junior team. Now he’s gone signed with Quick Step. What’s a Spanish stage racer doing with Flemish cobble eaters? Of course Quick Step rhymes with spring classics for many cycling fans but of course the team is more wide-ranging these days. With Mas there’s also a long-standing connection to Specialized and the US manufacturer is keen to nurture talent from the youngest age and they took him on-board the Contador junior team and he then moved to the Quick Step feeder team, each time with Specialized backing. Now Quick Step team is the only World Tour squad to employ a scout, Joxean Fernández Matxín. Back to Mas, who was Spanish junior time trial champion in 2012 and had a very consistent season last year with wins and high places in all the major mountain stage races including a win in the Tour de Savoie Mont Blanc and second place in Valle d’Aosta behind Ravasi. Does nominal determinism dictate the future of Rob Power? He featured here a year ago because of the promise of his power but then got robbed of his full first pro season by a bone marrow illness which ruined most of the year. He’s made a good recovery and resumed racing late in 2016. It took a while to get going, the Tour of Britain was a week of hanging on to the wheels but he finished the year with a podium in the Japan Cup. Orica-Scott are overflowing with stage racing talent at the moment but Power won’t be surplus to requirements and he’s still tipped as the biggest Australian talent for some time. He’s easy to spot because of his giant hair that spills out of his helmet. Rémi Cavagna‘s from the Auvergne region in central France that’s also home to Romain Bardet and Julian Alaphilippe. Now he’s joining Alaphilippe at Quick Step but unlike these two punchy climbers Cavagna is a time trial specialist. This ability has owed more to brute force than pacing strategies and wind tunnel sessions. He himself has said in interviews that tactics and finesse are not his thing, or at least there’s progress to make here. He’s known as the kind of rider who can is very hard to bring back once he gets 50 metres ahead of the peloton. If things go well France will have a classics contender but we’ll see, he could equally become a valuable lead-out rider too. Neo pro? All the riders above are new pros starting their first year with top teams, except Robert Power. But the strict definition of a neo-pro is “any rider who joins a UCI World Team or Professional Continental Team for the first time no later than during his twenty-fifth year” and applies to first and second year pros because any pro signed into the World Tour or Pro Conti ranks has to have a minimum two year deal. As ever for all the names, talents and promise remember that almost every neo-pro was once a hot shot, a star in the making who collected more silverware than a pirate. Success in the coming season and beyond are as much about learning, adapting and working as they are about inherited DNA and accumulated kilometres. Hopefully some of the names above become champions but some may simply become valued team workers. Finally if you have any local tips please share in comments below. It’s hard enough to follow the main European scene for U23 riders let alone to know who are the hot prospects in America, Asia or Africa. Off to a great start. There’s been a conveyor belt of riders out of the Aussie track programme and it’s interesting to see how they get one, as if they all seem to leave an identical mould and then emerge into different riders although of course there’s plenty of subtle variety in a 4000m pursuit rider. Krists Neilands (1994, Latvia) is not a top 10 material yet, but steady progress. Moved to Pro Conti ranks (Israel Cycling Academy) from Axeon Hagens Berman. Had some good results in spring classics: 5th in Ronde van Vlaanderen Beloften, 10th in Liège – Bastogne – Liège U23. How is 5th in Ronde U23 or 10th in LBL U23 notable as a 21/22 year old? 3 (count ’em, 3) Italians on your list? Mamma Mia! The economy there might have killed off top-tier sponsorship for the time being, but it seems there’s no lack of talent being nurtured below? I’m not gonna hold my breath but the upcoming Nibali vs Aru season might even entice (with some help from an improving economy?) a major backer to Italian cycling? Rumors were Segafredo was going to put more into that team than Trek but I guess it didn’t happen, but I can hope, right? And maybe the team with Colnago bikes and Campagnolo components might see the return of an Italian sponsor? Whoa, I’m getting carried away here. Forza Italia! Italy’s got a pyramid with the top stone missing, the lack of a World Tour team doesn’t mean the base of clubs, an U23 scene with big races and more is still there. People cite the recession as the reason but if companies like Bardiani can back a team then surely other medium sized teams can? Colpack, Zalf, etc. seem to be doing OK, which brings us back to the insane amounts of money required to field a competitive team at the top level. I read somewhere a description of a “modest” team at that level with a budget near 20 million and what does Murdoch spend on SKY? 30 million? “Heinie’s Folly” + continued drip, drip, drip of doping scandal + economic woes = the current situation in Italian cycling..and let’s face it, the rest of Europe’s not in such great shape either unless your team is backed by gambling interests or the bike industry with a few exceptions. my thoughts as well. i kept scrolling and kept seeing Italians! No mention of the American lads–Powless and Costa? They were both Top 5 in the l’Avenir last year. Perhaps they are not Neo-pros? Yes, they’re not neo-pros by the definition yet as they’re both on a Continental team and these teams are semi-pro by definition as many if not almost all riders within this tier are unsalaried. It’ll be interesting to see how Costa is nurtured, the Specialized plan linked to Enric Mas above seems likely, Costa has already been a stagiaire with Quick Step thanks to Specialized who also sponsor their Axeon Hagens Berman team. Lots of grassroots enthusiasm from Australian cyclists for Brendan Canty. Mads Würtz Schmidt’s mother Susanne Würtz was a national team road rider in her day. Dad Steen Schmidt was a late bloomer with maybe a lot more potential than he showed in his relative short career. Thanks for this INRNG. On another topic, you have written before that you welcome suggestions for future posts…an explainer of the latest UCI rule changes would be very welcome. I am struggling to make sense of it and you are usually very good at digesting and summarising that kind of thing, teasing out the less obvious implications and who the winners and losers might be. That’s actually a draft in the works right now but the problem is making sense of it all. “…on the same climb that Ryder Hesjedal used to power away and ultimately win the Giro d’Italia.” Power away, wink. That made me smile. But like Donald Trump, it hasn’t stopped many CN commenters from strongly believing it. Why let facts spoil the fun. Actually given Mitch Docker’s current rock’n’roll appearance Power may not stand out as much as you’d think. Isn’t Hugh Carthy a neo pro? Looking forward to seeing how he goes this year. He’s spent two years with Caja Rural already, a Pro Conti team so it doesn’t count. A good pick. Norway seems to pump out talented riders and Joker especially. Amund Grøndahl Jansen, Norway. (b. 1994) Neopro with Lotto Jumbo. Also came from the talent factory Team Joker. Stage winner in Gironde and Avenir. Won ZLM Tour. Won U-23 nationals. 5 in U-23 worlds after pulling Halvorsen to victory. Classics rider with a power sprint. Being Costa Rican I a very excited about Gianni Savio’s Androni Sidermec new discovery, 18 year old Costa rican Kevin Rivera. A local of Pacayas (1800mtrs) near the Irazu Volcano, he tested an amazing 90% VO2. Savio had never seen anyone testing so high, so he ordered another Vo2 test, in which Kevin confirmed the 90%. His first race with the team will be Vuelta al Tachira. We might have a successor for Amador. Great rwrite-up, but I noticed a few mistakes. 2. Enric Mas was second at Aosta to Kilian Franminy not Edward Ravasi. Last year, some time after his win at the track, Filippo Ganna shared some training time with Tamouridis. He, in his FB page, asked his followers to guess the average wattage in Ganna’s gold medal (and NR) performance: 655 watts for 4’16” !! I watched that ride and hopefully still have it recorded. Quite astonishing. His power, exuberance and enjoyment of the event itself really hit me. Hamish Schreurs also possibly worth mentioning as a neo for Cycling Academy. Stagiare for Etixx last year and 3rd in U23 Paris-Roubaix 2016. Another alumnus of the Klein Constantia team repeatedly appearing in your list. Looks promising for the classics. a bit of education on the new kids in the peloton. Nicholas Schultz is another Australian who may be interesting to follow, at Caja Rural. I am really impressed by his progression. His is a story of perseverance. He used to ride in the same small local team as my son as a 16 year old (“allievi” they are called in Italy). None of them was a champion, to say the truth. The most impressive result that year came probably from Ravasi himself, in the shape and form of a sixth place in a race in the cold and under pouring rain. He was definitely not “tall and lean” at that time. Next year he moved on to a small local “juniores” team and did not win a single race for the following two years. He, indeed, performed better in the harder, longer and colder races, but still was flying under the radar coverage. Probably only in his second or third year as an U23 did he win his first race. Again, the longer and the harder the race got, the more chances he had of doing well. He should be used as a warning to all those parents of 7-18 years old who think their son is the new Merckx as soon as he wins his first local race and as an encouragement to all those that find it really hard to win one as a teenager. I wish him all the best for the year to come!